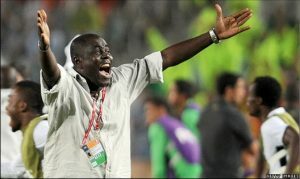 Ghanaian Sellas Tetteh has been named as caretaker boss of Sierra Leone as the search for a permanent coach is put on hold. Tetteh is the Ghana under-20 coach and will take the Leone Stars job after an agreement between the Sierra Leone and Ghana football associations. The 58-year-old has been contracted for three months. His first match will be an African Cup of Nations qualifier against champions Ivory Coast on 5 September. The venue for the match against this year’s Nations Cup winners is yet to be decided as Sierra Leone is currently not allowed to host international games due to Ebola. Tetteh, who won the 2009 Under-20 World Cup with Ghana, will be assisted by a group of local coaches. Leone Stars lost their opening Nations Cup qualifier 1-0 to Group I opponents Sudan in June, when John Jebbor Sherington was caretaker coach. Group I also includes 2017 Nations Cup hosts Gabon but their matches will not count towards qualification. Only the group winners advance to the finals. The former Black Stars and Rwanda coach will also be in charge of Sierra Leone’s first 2018 World Cup qualifying fixtures home and away to Chad in early October. If Leone Stars progress to the second round Tetteh, will continue in the role against Egypt in November. Six coaches have been shortlisted for the job including local trainer John Keister. The other five are all Europeans; Croatian Drago Mamic, Herzog Carsten of Germany, Belgian Luc Eymael, Serbian national Savisa Milosavljevic and Tahseen Jabbary of Netherlands.